Sec 47 of Marine Insurance Act 1963 :Change of voyage. (1) Where, after the commencement of the risk, the destination of the ship is voluntarily changed from the destination contemplated by the policy, there is said to be a change of voyage. of change, that is to say, as from the time when the determination to change it is manifested; and it is immaterial that the ship may not in fact have left the course of voyage contemplated by the policy when the loss occurs. Pterocarpus santalinus is a species of Pterocarpus native to India better known as ‘Read sanders’ is one main and lucrative market for smugglers as a high price is paid for this wood in China. 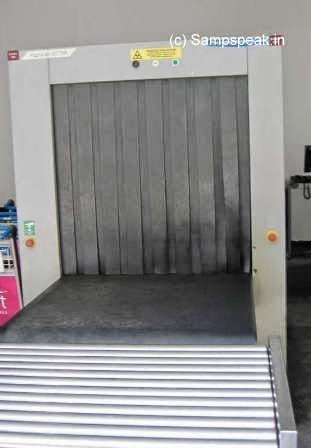 In every airport, our luggage is subjected to scanning – ‘non-intrusive’ method of inspecting and identifying goods to check and control the type of goods carried, rather preventing carriage of banned items. Understand that there are specialized equipments for scanning intermodal freight shipping containers too. Even in US it is not one hundred %; over there it is spearheaded by the Department of Homeland Security and its Container Security Initiative (CSI) with the main purpose being to detect special nuclear materials (SNMs), with the added bonus of detecting other types of suspicious cargo. In other countries the emphasis is on manifest verification, tariff collection and the identification of contraband. In US too, one of the challenges is of staffing the thousands of scanning monitors that would be required at ports. Another is a lack of physical “choke points” where large numbers of containers can easily be scanned on their way through ports. Recently, Times of India reported that ‘smugglers make hay as container scanner lies unused’ … While the menace of smuggling increases steadily , most containers at ports are left unchecked due to lack of infrastructure and severe staff crunch in the customs department. Three years ago, there were plans to install a scanner at the Chennai port, through which trucks would pass for clearance. When physical scanning of all containers seemed impossible, installation of a fixed scanner looked like a solution. However, three years after the announcement, it is yet to be installed. Recently , the Chennai port received another scanner with robotic arms to screen containers. This robotic scanner can spot special nuclear material, besides detecting suspicious cargo inside a container. The scanner reached the port several months ago, but the commissioning has been delayed as there is confusion over the location to install it. “It needs a safe location as the scanner contains radioactive elements. We are talking to experts from the Babha Atomic Research Centre for its commissioning,“ an official said. While lack of infrastructure to scan containers has allowed smugglers to operate freely, shortage of manpower in the customs department adds to the problem. Most containers at the port unchecked as the customs department does not have the manpower to conduct even basic inspection. According to officials, the central government has not recruited customs officers despite earning a revenue of more than `25,000 crore annually from the Chennai customs house zone itself. With large-scale smuggling, officials estimate a revenue loss. However, a senior customs official said that if red sanders and other contraband could be smuggled easily through the ports, smuggling arms and drugs were also possible. ~ today there is another interesting report in Times of India titled ‘Change of course - Ships with 40t red sanders to return’ …. Here is the same too reproduced : In Middle Of Smuggling Boom, Revenue Sleuths Force Freighters With Protected Wood To U-Turn Mid-Sea, Head To TN. In the first week of May, two container ships carrying more than 40 tonnes of smuggled red sanders set sail for Dubai and Hong Kong from a port in Tamil Nadu. By the time enforcement agencies received information about the consignments of contraband worth at least `18 crore, they had crossed international borders. But directorate of revenue intelligence (DRI) sleuths acted swiftly and alerted their counterparts in the ships' ports of call. Now, in the first instance of an anti-smuggling operation of this magnitude, the two freighters -the Dubai-bound ship carrying two containers filled with logs of red sanders and the other with one container - have been forced to turn around mid-sea and head to Chennai port with the contraband they are carrying. They are expected to arrive within a week. The operation is being carried out even as smuggling cartels based in Chennai, Tuticorin and ports in Andhra Pradesh have stepped up operations to cart away huge quantities of red sanders -the timber of which is highly valued in China and Southeast Asia for its purported medicinal qualities and its use in the manufacture of musical instruments and furniture -ahead of a proposed government move to sell seized logs in the international market. Revenue officers sent alerts to keep tabs on the multimillion dollar business in the trade of red sanders from ports in south India and from Mumbai following a Union government notification permitting the export of more than 9,700 tonnes of red sanders from stock confiscated by the Andhra Pradesh government and the directorate of revenue intelligence. The sale of red sanders (Pterocarpus santalinus) is banned under the Wildlife Protection Act as well as Section 29(4)(a)(i) of the Andhra Pradesh Forest Act. Red sanders are native to a small geographic area in the districts of Kadapa and Chittoor in Andhra Pradesh. DRI officers estimate that smuggling of red sanders has doubled in the past three months. DRI and customs have seized over 40tonnes of red sanders each in this period, or more than half of the total seizures in the past. Red sanders are worth `45lakh or more per tonne in the international market. 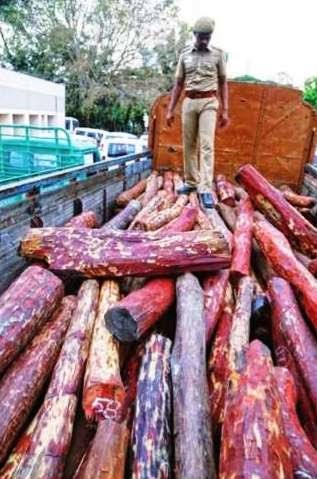 In their last major seizure, DRI sleuths confiscated logs of red sanders weighing nearly 2.2 tonnes from a container which was to be loaded on a vessel at Chennai port. The consignment, marked as ragi (finger millet), was bound for China.